"Important and iconic flora and fauna of Fiji has been selected to replace her Majesty Queen Elizabeth II's portrait." This is ambiguous and could suggest that a different flower or beast could adorn the obverse of each coin. I suspect that it will turn out to be a single design featuring various flora and fauna, but time will tell. The only example of different obverses I can think of is where coins have a coat of arms, but on the higher denominations a pair of supporters is added to the coat of arms. I can't think of any concrete examples just now, but rightly or wrongly I have Georgia (central Asia) in my head. Most places has some consistency, either a coat of arms or a portrait. I can't think of anywhere that uses different designs on each side of its circulation coins. This is quite common on 15th and 16th century coins. 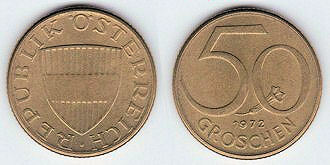 As many people couldn't read and the coins did not have denominations on them anyway, the design had to be different. A modern example of this phenomenon is the US. My experience of English 15th/16th century coins is that different denominations can look frustratingly similar, especially given the irregular planchets and effects of clipping that tend to bedevil hammered coins. By the time of the height of Elizabeth's coinage, when a truly enormous range of small(ish) change was being minted, they did start to make changes. Nevertheless, these weren't consistent over time. The convention in her reign of putting the date on the ¾d, 1½d, 3d and 6d but not on the ½d, 1d, 2d and 4d is reasonably consistent, but in other cases, sometimes the denomination of pennies and halfgroats was shown by pellets (one or two) behind the Queen's head, and other times you get roses in the same place on some denominations and not others -- agreeing a price for something, and making sure you hadn't been diddled in a dim tavern, must have been difficult back then! A modern example of this phenomenon is the US. A different design on every obverse and reverse - the US, yes! Then we have the Philippines circulation set of 1983-1994: the obverse depicted different national heroes, while the reverse portrayed various examples on wildlife. So that's two already. Would some of the euro circulation sets fill this criteria? e.g. Italy, Greece, Slovenia? You could almost make a case for that, but not quite. 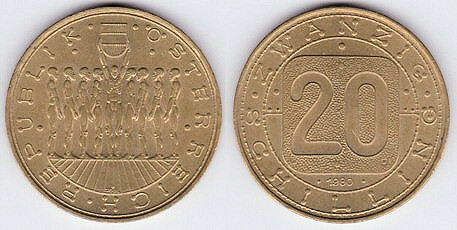 One side (don't know whether it's obverse or reverse) has a different pictorial design for each coin; whilst the denominational sides falls into three groups: 1, 2, 5 cents; 10, 20, 50 cents; and 1 and 2 euro. Each of those three denominational groupings - but not each coin, if you exclude the denomination - has a different design, therefore these sets do not fit my criteria. And to be more specific, I was looking for sets where each coin had a different pictorial design on each side - not just a symbolic or semi-symbolic design. Tonga is a partial case. 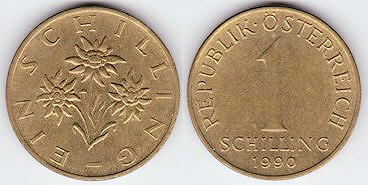 From 1975 onward, the 1, 2 and 5 seniti coins each have a different obverse and reverse design. However, the remaining coins of the set all have the uniformed king on the obverse. 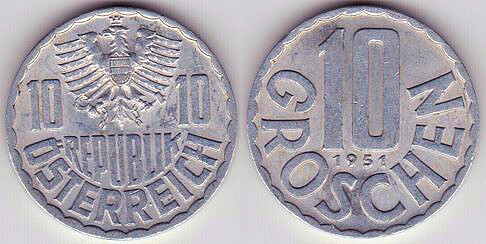 Hmm, Austria comes to mind: The last schilling and groschen pieces were not "one design series" as they were first issued at different times. Also, I left the lowest denominations (0.01, 0.02, 0.05) and the highest one (50.00) out as they hardly circulated. The silver and gold pieces are not included either. 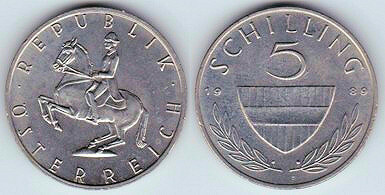 The 20 schilling coin later came in various commemorative designs. Well, these six all have different looks on either side. The Icelandic set issued in the 1980s (and who know which parts of it still circulate) fits into this concept. Here are just three of the coins in that series. 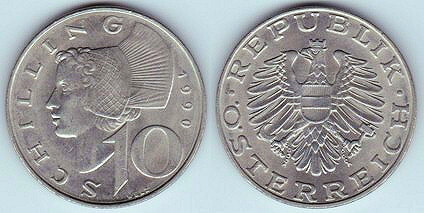 Finland, prior to the euro, from the 1990s onward, is another example. Greece, prior to the euro, from 1976 onwards also fits this concept. I won't illustrate them, as I'm sure we are familiar enough with them. Fiji issues its new Queenless series in January 2013, though I understand the coins are dated 2012, which suggests there was some unexpected delay in their issue. The Queen's effigy has been replaced by flora and fauna designs, whilst the existing reverses of cultural artefacts have been retained.